To Cite: Mansouri M, Mesdaghi M, Chavoshzadeh Z, Heidarzadeh M, Abdollah Gorji F. Allergic Drug Reactions: A Cross Sectional Study, Arch Pediatr Infect Dis. 2014 ; 2(3):e14290. doi: 10.5812/pedinfect.14290. Background: Adverse drug reactions (ADRs) occur in 10-20% of hospitalized patients and approximately 7% of general population. Drug-induced allergic reactions can affect numerous organ systems and manifest in a variety of reactions. Objectives: This study was designed to describe the frequency of different types of allergic drug reactions and uncover culprit drugs. Patients and Methods: All patients who had been admitted to Mofid Children’s Hospital, Tehran, Iran due to drug reactions during April 2009 to April 2010 were included in this study. Patients who fulfilled the criteria for an allergic drug reaction according to Gell and Coombs classification, were enrolled in the study and patients with ADRs whose symptoms were not compatible with allergic reactions, were excluded from the study. An immunologist and allergist diagnosed drug allergy. A complete questionnaire was filled out for each patient. Results: A total number of 117 patients were evaluated for adverse drug reactions, among them, 97 (82.9%) were considered to have immunological drug reactions. The most common symptoms of allergic drug reactions were morbilliform eruptions, serum sickness, DRESS (drug rash with eosinophilia and systemic symptoms), and toxic epidermal necrolysis. In 62 patients, anticonvulsant drugs had the prominent role and the most important anticonvulsants were phenobarbital, lamotrigin, and valproic acid. In 52 patients, antibiotics were found culprit and the most common antibiotics were cefixime, co-trimoxazole, and furazolidone. Conclusions: We found that delayed types of allergic drug reactions, as well as morbilliform skin eruptions, were the most frequent presentations among our patients. Anticonvulsants were identified as the first cause in the majority of drug reactions. These medications should only be prescribed when necessary and the patients should be informed about adverse reactions. This study provides a background for more extensive studies in this regard. Adverse drug reactions (ADRs) are classified into predictable and unpredictable reactions (1). These reactions occur in 10-20% of hospitalized patients and approximately 7% of general population (2). Drug allergies are classified as unpredictable reactions, mediated by adaptive immunity (3, 4). The Gell and Coombs system is the most common method of classifying drug hypersensitivity (5). It is comprised of immediate-type reactions, mediated by drug-specific IgE antibodies (type I), cytotoxic reactions, mediated by drug-specific IgG or IgM antibodies (type II), immune- complex reactions (type III), and delayed-type hypersensitivity reactions mediated by cellular immune mechanisms (type IV) and also 4 sub-divisions for type IV reactions including IVa, IVb, IVc, and IVd (5). The initiation of the immune response causing a drug allergy, involves several factors, such as the route of entry, dose, biotransformation, and protein-binding (6). Some drug allergies can be classified according to this classification, for example type-I for penicillin-induced urticaria and anaphylaxis (7, 8), type-II for cephalosporin-induced hemolytic anemia; type-III for heterologous serum sickness; and type-IV for contact dermatitis. However, this classification is not valid for all cases (9). Drug-induced allergic reactions can affect numerous organs systems with different manifestations. Many drug-induced allergic reactions can have more than one mechanistic pathway (10). Cutaneous manifestations are the most common manifestations of drug-induced allergic reactions; however, drug-induced allergic reactions present with clinical signs and symptoms of hepatitis, pneumonitis, hematologic abnormalities, lymphadenopathy, or arthralgias (10). Immediate-type hypersensitivity reactions are defined based on the timing of the appearance of clinical symptoms, which mostly happen within a few minutes to 2 hours, with specific clinical features like urticaria, with or without angioedema and anaphylaxis at the end of spectrum. Anaphylaxis is a severe allergic reaction, involving multiple organs. Other types of drug hypersensitivity, class II to class IV hypersensitivity reactions, are the delayed types of reactions (3, 11). Maculopapular exanthems are the most common manifestations of delayed allergic drug reactions (12). These erythematous macules and papules first appear in the trunk and proximal of extremities, within 7 to 10 days of taking culprit drug (e.g. aminopenicillin), and stronger reactions may result in erythrodermia (12). Common elicitors include antibiotics, such as aminopenicillins and quinolones (13), and antiepileptic drugs (14). Serum sickness classically presents with fever, macular and urticarial exanthems, lymphadenopathy, arthralgia, and sometimes peripheral edemas. Classic serum sickness is an immune-complex-mediated type III reaction. The symptoms manifest typically after 6 to 8 hours of taking culprit drug (15). In contrast, serum sickness-like reactions are defined by the presence of fever, rash (usually urticarial) and arthralgias, occurring 1 to 3 weeks after drug administration (16). The most common cutaneous manifestation of drug-induced allergic reactions is generalized exanthems (also known as a maculopapular eruption). Urticaria, angioedema, or both, are other common cutaneous drug reactions that can be due to IgE-mediated reactions, serum sickness, pseudoallergic reactions, or other mechanisms (e.g., bradykinin-mediated). Maculopapular or morbilliform exanthems, which manifest as erythematous macules and infiltrated papules, mostly affect the trunk and proximal extremities (17). The most severe forms of cutaneous drug reactions are Stevens-Johnson syndrome (SJS) and toxic epidermal necrolysis (TEN). The drug rash with eosinophilia and systemic symptoms syndrome (DRESS) is another cutaneous, drug-induced, multiorgan inflammatory response that can be life-threatening. DRESS was first described in conjunction with anticonvulsants and it was characterized by a triad of fever, skin eruption, and internal organ involvement (18, 19). This syndrome has been described for a number of drugs, including anticonvulsants, sulfonamide antibiotics, dapsone, minocycline and allopurinol (18-21). AGEP (acute generalized exanthematous pustulosis) is characterized by a fever above 38°C and a cutaneous eruption with nonfollicular sterile pustules on an edematous erythematous background (22). It is very important to distinguish between non-immunological drug reactions, mostly related to drug chemical properties, and immunological (hypersensitivity or allergic) reactions. Non-immunological drug reactions are predictable and thus are avoidable. In contrast, immunological reactions are unpredictable and caused by immunological responses, which may have an abrupt onset or be life-threatening, for instance, anaphylaxis. These reactions may mislead the therapists for diagnosis of an autoimmune disease or malignancy or they may even have similar presentations to cytokine storming and again be fatal like TEN. It is obvious that physicians’ knowledge about these kinds of reactions and proper decision-making for immunological interference by drugs or other modalities could be life-saving for the patients. Our aim was to describe the frequency of different manifestations of allergic drug reactions and uncover culprit drugs in pediatric patients. This study was carried out in Mofid Children’s Hospital, Tehran, Iran, between April 2009 and April 2010; this hospital is a referral center for pediatric patients. All patients admitted due to drug reactions during this time period were included in this study. Patients whose symptoms were not compatible with an immunological drug reaction, including all type A or predictable ADRs (related to physicochemical properties of drugs), due to known pharmacological side-effects, over-dosage, secondary effects, and drug interactions, were excluded from the study. The inclusion criteria were all types of drug reactions, unpredictable (type B, mostly associated with host factors) and compatible with one of the above mentioned classes of the Gell and Coombs system or those matched with any of the known drug allergic syndromes including TEN, SJS, AGEP, fixed drug eruption, drug-induced lupus erythematous, etc. An immunologist and an allergist diagnosed drug allergy. A questionnaire was filled out for each patient, including demographic data, type of clinical signs and symptoms, the usage of different drugs, the interval between taking the medications and the beginning of the reactions. Diagnosis of drug allergy and its type was determined according to the following data, time period between taking the drugs and the presentation of the reactions, results of clinical examinations, and type of clinical signs and symptoms including dermatological presentations. All drugs taken by patients were recorded in the questionnaire, so there might have been more than one drug that had to be considered for each patient. The results were analyzed using the statistical package for the social sciences SPSS version 15 software. This study was approved by the Ethics and Research Committee of Shahid Beheshti University of Medical Sciences. A total of 117 patients were evaluated for adverse drug reactions, among them, 97 (82.9%) were considered to have immunological drug reactions, and 20 (17.1%) had non-immunological adverse drug reactions. The mean age of patients with immunological drug reactions was 51.45 ± 39.14 months old. From the patients, 47 (48.45%) were females and 50 (51.55%) were males. The culprit drugs are summarized in Table 1. In some patients, two or more drugs had been used before the reaction. In 62 patients (63.9%), anticonvulsant drugs had the prominent role and the most important anticonvulsants were phenobarbital, lamotrigine, and valproic acid. In 52 patients (53.6%), antibiotics were found culprit and the most common antibiotics were cefixime, co-trimoxazole, and furazolidone. 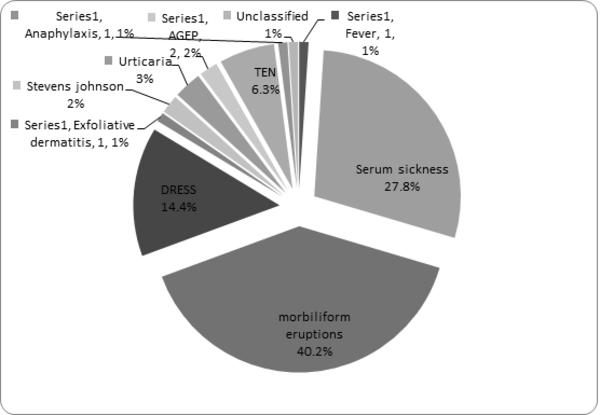 The most common symptoms of allergic drug reactions were morbilliform eruptions, serum sickness, DRESS, TEN, acute urticaria, AGEP, SJS, fever, exfoliative dermatitis, and anaphylaxis, highlighted in Figure 1. Serum sickness occurred following intake of cefixime in 7 cases, furazolidone in 6 cases, co-trimoxazole and amoxicillin in 4 cases, ceftriaxone in 3 cases, cephalexin, vancomycin, and erythromycin in 2 cases, and nalidixic acid and co-amoxiclave in one case. Totally in 24 of 27 patients with serum sickness, antibiotics had the main causative role. Morbilliform eruptions were seen in 39 patients due to antibiotics in 7 patients, including: penicillin in 2 cases, co-amoxiclav in 2 cases, amoxicillin in 2 cases, cefixime in 2 cases, co-trimoxazole in 2 cases, and vancomycin and ceftriaxone in one case. We also noticed a significant number of morbilliform eruptions after taking anticonvulsants including phenobarbital 22 cases, lamotrigine 6 cases, carbamazepine 2 cases, valproic acid 2 cases, primidone 1 case, liskantin 1 case, and phenytoin 1 case (Table 1). DRESS was noted in 14 patients, after taking antibiotics (co-trimoxazole) in one patient, and after intake of anticonvulsants in 13 patients (92.8%): 8 cases (57.1%) were due to phenobarbital, 4 cases (28.5%) lamotrigine, 2 cases valproic acid, one case phenytoin, one case primidone, one case nitrazepam, and one case carbamazepine consumption. In patients with SJS (2 patients), anticonvulsants were the culprit drugs including carbamazepine, lamotrigine, and nitrazepam (Figure 1). AGEP, acute generalized exanthematous pustulosis; DRESS, drug rash with eosinophilia and systemic symptoms; TEN, toxic epidermal necrolysis. Among the 6 patients with toxic epidermal necrolysis, 3 cases were due to anticonvulsant drugs including: lamotrigine, diazepam, and valproic acid. From the three remaining cases of TEN, one was probably due to imipramine and in another one, problem occurred after using chloramphenicol eye drops while the causative drug remained unknown for one case (Figure 1). We had one case of fever following phenobarbital intake. We also had 3 cases of acute urticaria, one of them occurred following Ibuprofen intake in a 6 year-old boy, another one after ceftriaxone administration, and the last one after local usage of calamine. We also had 2 cases of AGEP, one occurred after taking cefixime, furazolidone, and diphenoxylate, and the other one was due to ritalin and haloperidol (Figure 1). Anaphylaxis was the presentation of drug allergy in one patient, a 6 month-old male, 10 minutes after DTP (diphtheria, tetanus, pertussis) and polio vaccination. We noticed that exfoliative dermatitis has occurred in a 3.5 month-old infant, who had taken different kinds of antibiotics, mainly beta-lactams (Figure 1). Adverse drug reactions are common among hospitalized patients (10-20%) (2). These reactions can have different manifestations and can even be life-threatening (11). Immunological drug reactions make up around 6% to 10% of all ADRs in the literature (23), while we noticed that this ratio was about 82.9% of all patients with ADRs admitted in our hospital. This ratio was tremendously more than previous reports, which may be due to the fact that all kinds of ADRs are not admitted to hospitals and are managed by outpatient care and there may be a lack of accurate statistics of ADRs in our community. However, this could imply the significance of more serious allergic drug reactions. In the present study, the most common symptom was morbilliform eruptions, with about 40% prevalence, in accordance with other studies and even slightly more frequent than previous reported study (about 30%) (24-26), while serum sickness-like reactions and DRESS were the second and third most prevalent, respectively. Maculopapular exanthems or morbilliform rashes, the most common delayed manifestations of drug allergy, were mostly seen following treatment with anticonvulsant drugs (phenobarbital, lamotrigine, and valproic acid) while antibiotics were the second cause of these types of drug allergies. However, in some studies, antibiotics (such as aminopenicillins and quinolones) (17) were reported to be the main causes of maculopapular exanthems, and anticonvulsants and radiocontrast media were the second and third most prevalent causative drugs (12, 13, 27). This is a significant finding which might be either due to improper prescription of anticonvulsant drugs or genetic allergic susceptibility of our population to these kinds of drugs. Totally, in 24 out of 27 patients with serum sickness, antibiotics had the main causative role, which is in agreement with other studies. We found that cefixime, furazolidone, and co-trimoxazole were the first three important drugs causesing serum sickness syndrome. However, in other studies, penicillin, co-trimoxazole, cefaclor, and rifampicin have been reported as the main causes of serum sickness-like reactions (28). These findings may be due to differences in people’s accesses to these antibiotics in our country or our physicians’ preferences for prescription of some medications. DRESS is a potentially life-threatening, drug-induced, multi-organ inflammatory response. This syndrome was first described in conjunction with anticonvulsants (17). Our results were compatible with previous reports (17, 18), indicating that about 92.8% of this syndrome occurred following anticonvulsants usage such as: phenobarbital, lamotrigine, valproic acid and carbamazepine. We noticed that anticonvulsants were the main cause (62.5%) of severe bolus cutaneous drug reactions (considering SJS and TEN together). It is worthy to emphasize the role of anticonvulsant medications in developing SJS and TEN. Of note, unlike other reports in which antibiotics have been reported as the main group of culprit drugs that cause these kinds of drug reactions, they did not have any roles in the majority of these reactions in our patients (29, 30). Instead, we had one astonishing case of severe TEN following administration of chloramphenicol eye drops, who was a recurrent case of TEN. This indicates that local usage of some drugs can also trigger TEN. The presentation of TEN may be related to different families of drugs, which could vary depending on the physicians’ preferences for prescription of drugs. We also had severe exfoliative dermatitis with erythrodermia in a 3.5-month old infant. This reaction might have been due to the administration of various antibiotics (mainly ceftriaxone). Ceftriaxone and vancomycin have been reported as culprit drugs in erythrodermia of neonates (31), although we also noticed severe exfoliation. Similar to previous findings in which AGEP, a form of cutaneous eruption with nonfollicular sterile pustules on an edematous erythematous background, along with fever, has been reported as most commonly associated with anti-infective agents, including beta-lactam and macrolide antibiotics (21, 32), we also diagnosed one case of AGEP associated with one of the third generation cephalosporins (ceftriaxone). We only had one case of anaphylaxis, 10 minutes after DTP and polio vaccination. The clinical manifestation following vaccination, like other drug reactions, may be classified as an immediate or a late-type reaction. It may most probably be due to vaccine constituents like gelatin, egg protein, chicken protein, thimerosal, antimicrobials, dextran, latex or yeast rather than the active agent of vaccines. IgE-mediated or immediate allergic reactions to vaccines are rare conditions and may affect the skin, including urticaria, flushing, itching or presents as a full-scale anaphylactic syndrome. Delayed-type reactions to vaccines are more common and present as fever and local swelling, although a less frequent type of delayed reactions may occur, including serum sickness and polyarthritis nodosa. Immediate allergic reactions to the DTP vaccine may be due to casein and derivatives of cow's milk in medium, from which DTP vaccines are usually prepared. The small number of allergic reactions to vaccines in our study may be explained by outpatient treatment of these kinds of cases (33, 34). We had another interesting presentation of drug allergy following ibuprofen administration, in which urticaria occurred after 5 to 6 hours. It is noteworthy that late-onset acute urticaria following NSAID usage is a very rare presentation in children (35, 36). We believe that sufficient knowledge about culprit drugs and their associated allergic clinical presentations would help us diagnose some unusual clinical symptoms, which may present as a clinical dilemma. We had a similar problem regarding DRESS, which sometimes imitates autoimmune or lymphoproliferative diseases even GVHD (graft versus host disease), which occurred in a patient taking anticonvulsant drugs for a long period. In that case, physician was misled because of his/her unfamiliarity with etiological associations between anticonvulsant drugs and DRESS. According to the results of this study, it can be assumed that the type of cutaneous symptoms can also help to find the causative agents. For example, we can take into consideration that maculopapular exanthems, the most common dermatological presentations of drug allergy in the majority of cases, who had taken anticonvulsant drugs, when we face a similar clinical presentation. On the contrary, we did not notice any associations between anticonvulsants and allergic urticarial eruptions, including immediate-type or serum sickness-like reactions. It would help to find the most culprit drugs in a multiple drug which can treat patients with allergic urticarial reactions. However, these results need to be confirmed with a bigger cohort of patients to show these associations precisely. A study for genetic predisposition and role of the probable HLA subtypes can also be helpful. We found that delayed-type hypersensitivity reactions as well as morbilliform skin eruptions, are the most frequent presentations among our patients. Anticonvulsants were identified as the first cause for the majority of drug reactions in our studied population. These findings may be due to two reasons including over-prescription of anticonvulsant drugs by physicians and some genetic predispositions of allergy to these drugs in our population. Culprit antibiotic drugs in the serum sickness-like disease were also different from what has been previously reported and were not beta-lactam drugs. This study provides a background for extended studies in this regard. Implication for health policy/practice/research/medical education: This research helps physicians, especially pediatricians and other medical staff get acquainted to allergic drug reactions, different types of these reactions and the culprit drugs in Iran. Authors’ Contribution: Mahboubeh Mansouri: concept/design, acquisition of data, drafting of the manuscript. Mehrnaz Mesdaghi: data interpretation, drafting of the manuscript, critical revision. Zahra Chavoshzadeh: concept/design, acquisition of data. Marzieh Heidarzadeh: concept/design. Fatemeh Abdollah Gorji: data analysis. Financial Disclosure: We have no conflict of interest. Funding/Support: There was no support for this study.